Just before 6:30pm today I crossed the dirt road that is 500 trail miles from the Mexican border where I was 5 weeks ago. I’m pretty proud of that but the crazy thing is it’s not fast enough. I’m now pushing ~25 miles per day and if I can keep that up I’ll be fine. I just need to watch the zero days. Davy kindly drove me and all the food bags from Agua Dulce to Green Valley. I was on the trail before 9am and that’s a very late start. It sure was hot already. I caught and passed Troll and Oblivious and since I’ll be upping my miles now I may not see them again for a while. We swapped contact info and if I’m needing help in Washington his wife might be able to arrange something. I got it into my head that I could reach the 500 mark some time during my morning break. So I set off up the hill at noon and soon felt like my face was going to melt. It didn’t but the river of sweat down my back has left a white salt stain across the seat of my trousers to show the tide mark. Some time later I passed Rest Stop sleeping under a tree. He didn’t hear me so I took a photo and moved on quietly. There were some really pretty sections in here, much more woodland than forest to me. Long green grasses under wide oak-like trees. So much dappled sunlight. It was gorgeous. Passing the 500 mile mark means the wilderness permit I have is now valid since it is only for hikers of trips this length or more. I guess that means I have fulfilled the definition of long distance hiker as far as the U.S.F.S. is concerned. But just so I didn’t get too complacent the next two hours were mostly uphill, with one nice easy, flat, dusty section just after Red Rock Tank. This is the latest I have hiked but I think it’ll become normal soon to get around the heat of the desert. 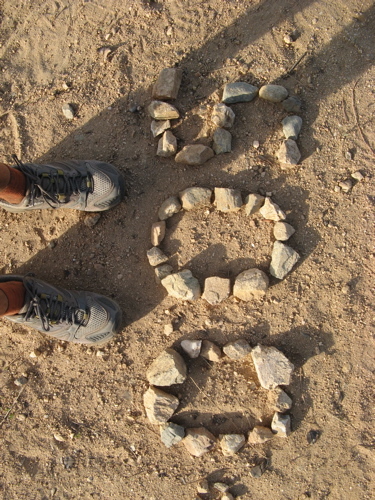 This entry was posted on Friday, May 25th, 2007 at 6:00 pm	and is filed under California, Cowboy, Hiking, Photo. You can follow any responses to this entry through the RSS 2.0 feed. Both comments and pings are currently closed. I’m actually closer than you might guess. I’m actually in San Jose at the moment but I think it’s going to be a bit too far (not to mention hit and miss) to try and find you. But, boy, that would have been a good surprise. You’re doing well and people are still asking about you. The blue pins are moving up the wall and I log on most days to check on progress. Everyone sends the best wishes.